An Architect's Idea Book: Sharing ideas and inspiration to help create beautiful living spaces. As much as we aspire to indulge in the spacious laundry rooms of the glossy magazine pictures, it is for most of us out of our reach. Somehow the extra square footage always seems better allocated to the family room or home office. No need to sigh! 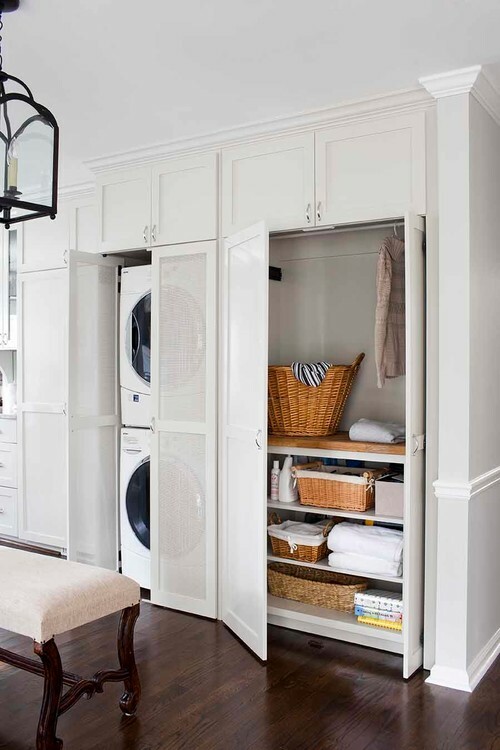 The laundry does not really need to be tucked away in its own room or hidden away in the basement. Doubling up a few spatial functions may just let you have your cake and eat it too! 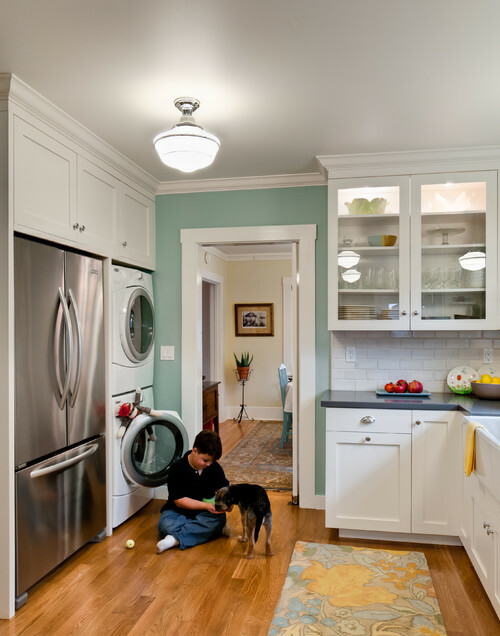 This lovely space brings together laundry, mudroom, and an area for the dogs to sleep. The traditional dutch door is a great idea to contain the dogs but still keeping the door somewhat open. The galley style layout suits the nature of the house. The traditional elements of the cabinet style and the Belfast sink (also known as a farmhouse or apron sink) work well with the character of the home, but by extending the upper cabinetry to the ceiling and adding some contemporary/ industrial lighting updates the space. 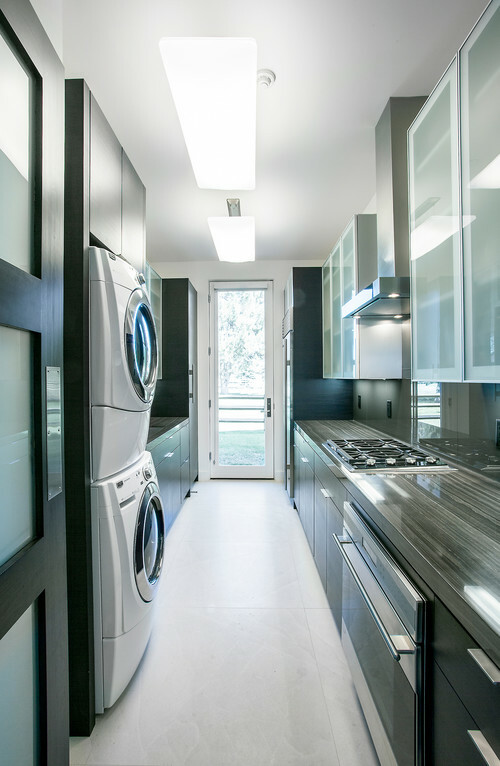 The washing machine and dryer are white, enabling a visual continuity throughout the space. The glossy blue painted ceiling is a great pop of colour without becoming over bearing. 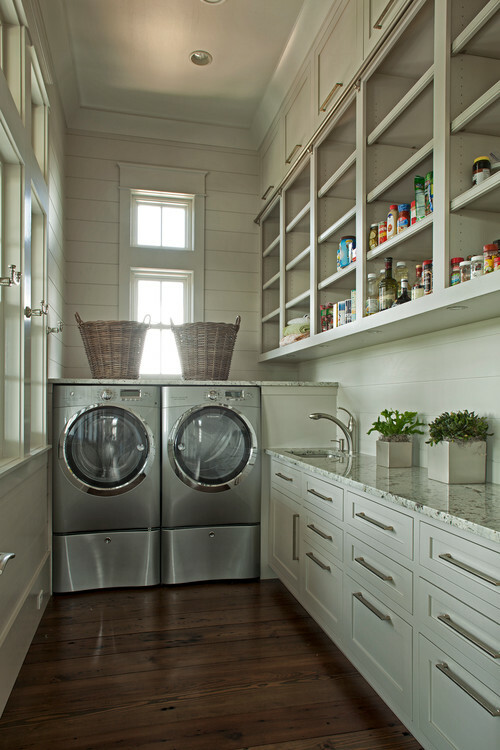 This laundry and mudroom combination is much wider and gives the opportunity to create more storage. The use of the built-in cubby and bench are great for mucky kids to drop their sport kits into the wash before they get any further into the house! The idea of placing the laundry in the mudroom near the backdoor is great for those of us who dry our clothes outdoors. Free energy is free energy, even if it is only for part of the year. Laundry and pantry: I have never considered this combination before, but it works. Instead of two narrow cupboards off the kitchen, there is only one. As long as your bleach and detergents are in separate cupboards from your food, this set up is great. The walls and the cabinetry are painted the same off white/ light grey. The granite counter also has the same hue as the walls for a more monochromatic appearance and the lower cabinetry is 18″ for more floor space. This makes this room appear much larger and open. 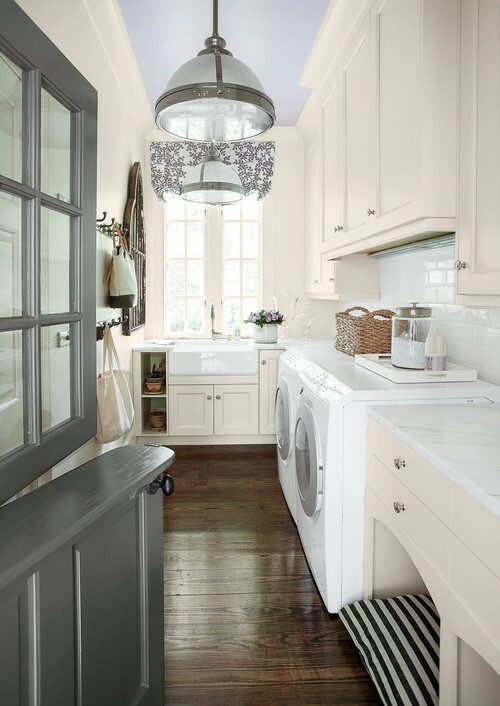 The laundry in the kitchen is more of a European norm, but it is becoming more common in North American homes. The appliances are becoming more compact which is much easier to incorporate into standard sized kitchens. This idea is not only space saving but the water and drain hook ups are already available. 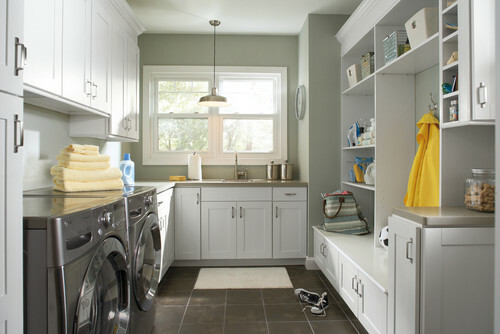 Traditional Laundry Room by Chesterfield Home Builders Bruning Homes, Inc.
Hobby and craft rooms are becoming popular. If you enjoy sewing, finger painting with the kids, or extra office space why not combine it with the laundry machines. They will be happy enough sharing the space and there is ample room for folding and stacking. Not all of us find the machines attractive. The machines can be stacked and hidden in a ventilated cupboard. Allow enough room for air circulation, since they door get hot when in use. The ventilated door shown is a perfect for screening off from the rest of the room whilst still allowing air to move freely. The beauty of this configuration is that is can be anywhere: in the kitchen, hallway, bathroom or any of the combinations above. Creating multi-functional rooms is a great way to start maximising your existing useable space. Categories: Utility | Tags: Bathroom, Cabinetry, contemporary, Countertop, dogs, laundry, mixed use, mud room, panrty, space saving | Permalink. The heart of the home is the kitchen. It is not only where we create sustenance for our family but also where we talk about our day, bond as a family, do homework, create projects and have fun making a mess! Sometimes we need to make the most out of the space that we have, no matter the size limitations. It just means that we have to be a bit more savvy with what we already have and know how much we can push to get what we want for the space, as long as we are realistic. 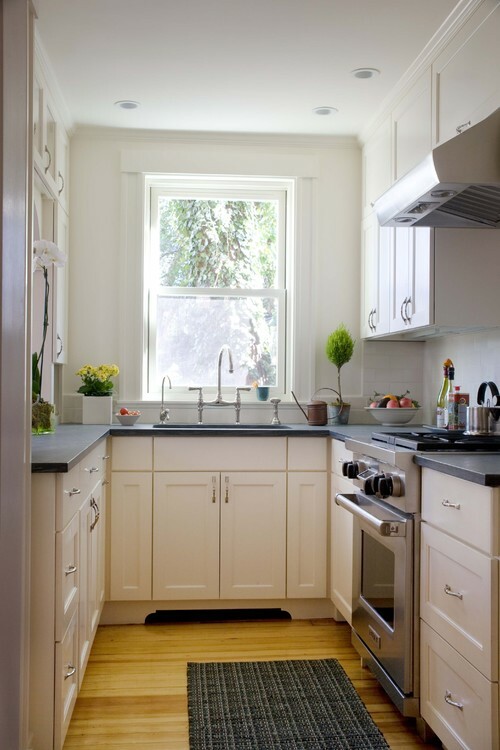 This kitchen in a 19th century row house, it is small but efficient. The traditional white cabinets, contemporary stainless steel appliances, and understated ironmongery/hardware lift this kitchen. Perhaps only one cook can fit into this kitchen at a time, but everything is just at your finger tips. This kitchen design emphasis in the de-cluttering and simplifying of the space. The cabinetry and ironmongery are uncomplicated in that they not distracting. A lovely little detail with the kitchen taps/ faucet where they are not resting on the counter and the sink is under mounted. This leaves the beautiful Pietra del Cardosa. counter to be visually uninterrupted. The small (can I say micro?) kitchen above appears larger due to the open concept into the dining room. 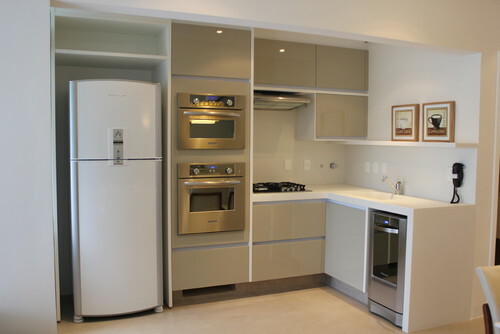 The choice of all white cabinets and walls allows your eyes to casually wander. The kitchen above is a prime example of the compact ergonomics. The best layout for small kitchens is to have the cooker, fridge and sink in an equilateral triangular placement. It is about promoting the ease of movement. Although I do understand the want to keep the full height window, however the kitchen would have been better served if the lower cabinets extended to the exterior wall for extra preparation space rather than the ability to walk around. It is such small space, storage and usable space are also vital. I do like a lot of the elements of this space, the simplicity of the pendant lights and Turner bar stools. The quartz counter and backsplash and the oak herringbone pattern flooring and the ceiling height cabinetry add a feel of luxury. It enhances the space with a sense of bespoke/ custom detailing. Space is precious in this small two storey. The limited footprint just fits the dining, living, kitchen, and powder room on the same floor. The high gloss smoky grey cabinetry gives this compact corner layout a high calibre studio feel. The shiny stainless steel appliances integrate well within the grey tones, while the choice of a fashionable white fridge tries to sink into the wall. Albeit, a custom built-in fridge with the same glossy smoky grey door would have looked stunning. The white solid surface waterfall detail has a lovely contemporary look at the edge of the counter. The look balances the white, grey, and steel tones beautifully. There is no ironmongery/ hardware to distract and break up the panels. Many cabinetry manufacturers offer a press-release system so that you can keep the design sleek and uncluttered. All in all, there are always options for any scale of kitchen project. Just keep to one design theme and work it throughout the room. Most importantly follow as many rules as your space can allow for ergonomics, storage, usable space and de-clutter. Categories: Kitchen | Tags: Cabinetry, contemporary, de-clutter, ergonomics, Home, Interior design, Kitchen, renovations, small kichen, storage, usable space, white | Permalink. This is not your mother’s kitchen! 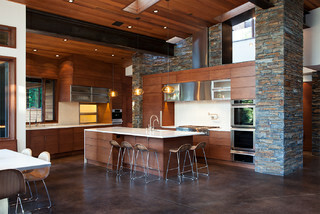 This beautiful contemporary kitchen by Ward-Young Architecture & Planning has me thinking of mountains and forest views. The lofty ceilings, the mix of stone and wood create a feeling of an alpine paradise. The stone veneer is rustic, heavy and has a great textural presence. It is offset by the smooth faces of the sleek cabinetry. The cabinetry sinks into the overall wood décor of the open plan. By using a similar wood treatment on the ceiling, window trims and door encourages your eye to accept the kitchen as an extension of the room, not as a visually separate room. The waterfall edge detail of the kitchen island surface boosts the contemporary nature of the space. The backsplash is also in white which enables you to experience the different materials in the space without congesting it. The flooring picks up similar warm hues as the wood. The large grid pattern of the coloured concrete creates a uniform plane that is not subtractive of the integrity of the high quality materials used in the space. Categories: Kitchen | Tags: Business, Cabinetry, Construction and Maintenance, contemporary, Countertop, Furnishings, Kitchen, Materials and Supplies, Open plan, stone veneer | Permalink. This house has many features and spaces that just makes it feel so welcoming. It makes you want to get comfy and unwind with a cup of coffee. 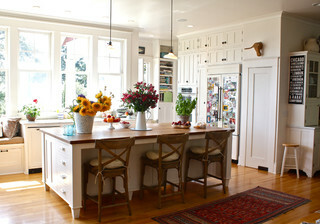 Of all the wonderful spaces, I just love this kitchen. The tall windows bring in a lot of natural light and creates a great connection to the outdoors which promotes a good sense of well being. Along the periphery there is tall white custom cabinetry that extends up to the high ceilings. This is a great way to add more storage and to create a modern edge within the traditional style without overdoing it. 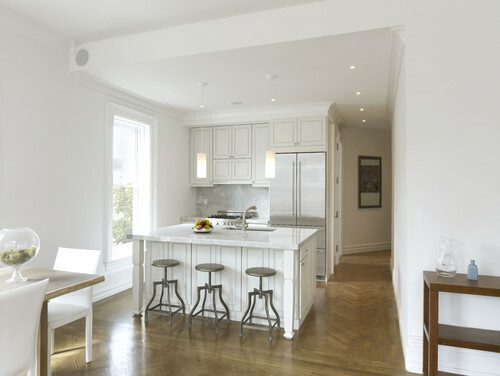 The walls and cabinetry are painted “cloud white” and are visually merged together. The ceiling coving also wraps around both cabinetry and walls. Both treatments add to the uniformity, openness and airiness of the space. 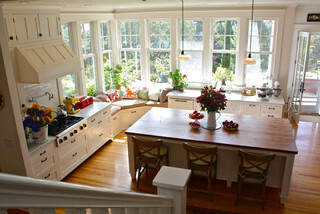 A gorgeous butcher block island adds warmth, practicality and a great breakfast area. The corner window seat is inviting and relaxing. 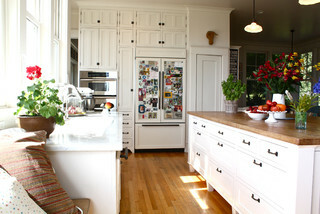 Although I adore this kitchen, there are a few things that I am not taken with. The refrigerator and hob/ cooktop are on the opposite sides of the kitchen. I could see as being a nuisance if you are like me and run back and forth to the refrigerator for ingredients. The sink is also far from the hob which is an issue when you are carrying a pot of steaming pasta that is ready to drain. Ideally, if one of the appliances were to be located in the island for a smaller work triangle it would be more user friendly. 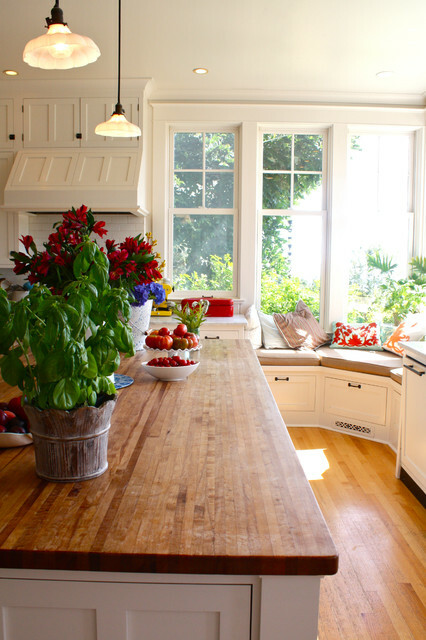 However, I do understand the desire to keep the island free in order to keep the visual of a farm house table work space in the centre of the room. It all depends what you would be willing to compromise: function or style. Overall, this is a spacious yet cozy room that blends the sensibilities of a family orientated traditional kitchen but does not hold back on the desires of the modern. This is a great area that mixes home cooking, conversation and relaxation for a great well balanced space. Categories: Kitchen | Tags: Cabinetry, Construction and Maintenance, Design, Kitchen, Kitchen and Bath, traditional, United States | Permalink.